In a powerful delivery in the nation’s capital, Rabbi Jonathan Cahn delivers profound words to America. Cahn shares the encouraging reality of the Judo-Christian heritage that the foundation of America is built on and the sobering truth of judgment that is the consequence of a nation that rebels from God and His ways. “…smiles of heaven can never be expected on a nation that disregards the eternal rules of order and right which heaven itself hath ordained.”These words of truth were in effect for the nation of Israel when they turned away from its original intent with God and they still ring true today for America. Cahn responds to these truths for a moment of decision for all of us. As Elijah declared on Mount Carmel for a people to choose who they will serve, this is the same moment we are facing. “Our God is not Baal, our God is not Molech, our God is not a government, our God is not money, our God is not power, Our God is not pleasure, our God is not political correctness, or any other man-made thing….There is only one God and He is the God of Abraham, Isaac, and Jacob…”. 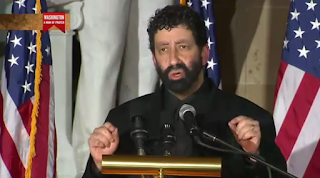 Hear these exciting words from Rabbi Jonathan Cahn, the hopeful message for our generation and the encouraging possibility of truths that lay ahead, and so much more. Greg and John shared in this segment.